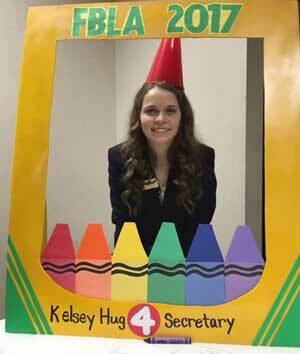 Kelsey Hug was elected as Kansas FBLA State Secretary. Calvin Young, Xavier Ard, Otis Costlow*, third, Emerging Business Issues. Cole Graham, ninth, Introduction to Information Technology. Cameron Koger, sixth, Local Chapter Annual Business Report. Carson Stumpff, seventh, Mr. FBL. Cameron Koger, fifth, Mr. FBL. Kelsey Hug, ninth, Ms. FBL. 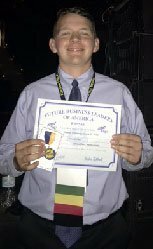 Carson Stumpff, 10th, National Who’s Who in FBLA. Kelsey Hug, ninth, National Who’s Who in FBLA. Kelsey Hug, Cameron Koger*, third, Partnership with Business Project. Hunter Ellenburg, second, Spreadsheet Applications. Brenden Hale, 10th, Spreadsheet Applications. Hunter Ellenburg*, second, Spreadsheet Applications. *Qualifies for national competition in Anaheim, California, June 29-July 2, 2017. Hunter Ellenburg shows his awards for spreadsheet apps. Other honors and awards For SFT-FBLA included the election of Kelsey Hug as state secretary for Kansas FBLA. Also, Cameron Koger was recognized with the Quality Member Award; Savannah Hinck, Kelsey Hug, Cameron Koger, Carson Stumpff wer listed in the Who’s Who in Kansas FBLA; Hunter Ellenburg, Savannah Hinck, Otis and Greta Costlow, Cameron Koger were designated as voting delegates. The chapter was recognized as a Gold Seal Chapter of Merit and placed third in total professional membership. Information and photos thanks to SFT-FBLA adviser Connie Lindell.